As part of the annual Dana Meadows Fellows Seminar, organized by the Sustainability Leaders Network here at Cobb Hill Cohousing, Vermont from 3-7 October, I offered a session on the art of sustainability at Sumner Falls, a wild and wooded part of the Connecticut River. The session focused on engaging the right brain, which is closely associated with thinking outside the box and creativity. Creative problem solving is essential for addressing the many challenges we face in bringing about a sustainable future for people and planet; art and creative expression is a powerful mechanism for enhancing this capability. I asked the group to start from a place of unknowing, of having no preconceived notions. I then asked them to observe what they saw around them, reflect, see patterns, play, and create an art piece. 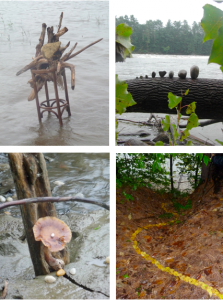 The recent flooding of the river meant that flotsam and jetsam were incorporated into many pieces, bringing order and beauty to the chaos. Afterwards, we toured the art pieces to hear reflections inspired by the creative process. This process of creating something out of found materials provided another method of storytelling for participants so that insights on personal and work lives emerged and were shared. Learn more about our Art of Sustainability efforts on the Sustainability Leaders Network website.